Footie Olympics 2012 free download for Symbian s60 3rd and 5th edition. 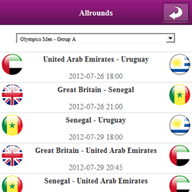 � Summary: Follow all the action in football from the Olympics 2012 in London via the Footie social network. Follow all the action in football from the Olympics 2012 in London via the Footie social network. Get involved and cheer for your favourite country like Great Britain, Spain, Mexico, Brazil, Egypt or New Zealand. Connect with soccer crazy fans now! Completely agree.And O/T, nice to see another blongigg Dons fan.Reguar political acoommodation might be hard for you & me to reach, I think, but let's face it, football's the thing that matters !